Kappa Sigma Graduation Cords are worn by members of the Kappa Sigma Fraternity at Graduation. They are double graduation cords of Red, White and Green braided cords. The official colors of Kappa Sigma are Scarlet, White and Emerald Green, which translate nicely into the honor cord colors of red, white and green. We do not currently carry a red, white, and green intertwined double cord. An alternitive with Honors Graduation would be to order a triple cord using one red honor rope, one white honor rope, and one green honor rope. Other options to create a Kappa Sigma Graduation Honor Cord would be to either use a red and white braided graduation cord from Honors Graduation, and have it made into a double cord with green. This cord would then have red and white in one cord and green in the other. Another similar option would be to use the Bright Green with White intertwined honor cord and combine it with a red cord. Both of these would be double cords with all three colors. Of course the other options are to just use two of the Fraternities three colors as either an intertwined cord or a double cord. Of course doing this would leave one of the colors out. At this time we do not carry a red white and green braided graduation cord that is all one strand. Kappa Sigma was founded in 1869 at the University of Virginia. There are now over 300 chapters in the U.S. and Canada, and 13,500 current active members. If you'll notice, the colors of Kappa Sigma, and those of Italy, are the same: Red White and Green (also the colors of the Kappa Sigma Graduation Cord). This is perhaps an allusion to the tradition in Kappa Sigma that the roots of the fraternity are in a group founded at the University of Bologna in 1400. The University of Bologna is one of the oldest Universities that is still functioning as one today. 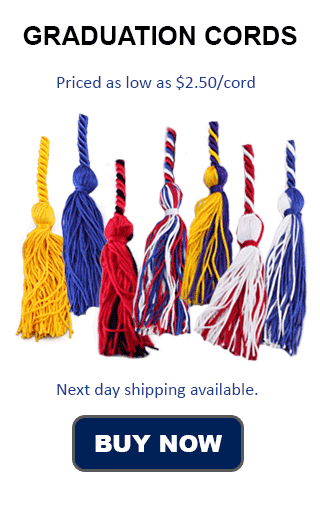 When you order Kappa Kappa Psi Graduation Cords from Honors Graduation, you know that you are not only getting a quality honor cord, you will also get it on time. This is very important for time sensitive products like graduation cords, where they are needed for graduation ceremonies or award banquets. We offer a variety of shipping options, including overnight delivery and our flat rate shipping option that will get your order to you in 4-6 days, no matter what the size, for one low price.